As I never get tired to mention I’m not such an avid fantasy reader and don’t fall easily for books from this genre. I don’t get in the mood for fantasy very often and when I do I usually get very picky when it comes to choosing a book and it often needs a lot of convincing by bookish friends or raving reviews to eventually make me read a fantasy novel, especially when it comes to books that also „force“ me to start a whole series. One of the books that made it through this thorough selection process was Scott Lynch’s „The Lies of Locke Lamora“ and what can I say: it quickly became one of my favorite books EVER. It took me a while to work myself into the story because the many sideplots and multiple timelines were confusing me at the beginning but once I had arrived in the book I just couldn’t stop reading anymore and the pages flew by without me even noticing. And since I loved this kick-off of the Gentleman Bastards series so much it was only natural for me to read the sequel „Red Seas Under Red Skies“ as soon as possible, hoping that I would enjoy it just as much. An when I had read the first pages of the second book I was even more optimistic that it could live up to my high expectations because Scott Lynch already managed to hit me in the feels so early again and I felt reminded of all the emotions that „The Lies of Locke Lamora“ had provided – but unfortunately this early shocker was going to be the last really intense moment for me for quite a looooong time. I was kinda prepared though for having a bit of a hard time with the sequel because I loved the setting of Camorr in the first book (and by „loved“ I mean that it was one of my favorite settings that I’ve ever encountered in a fictional story) and given the events at the end of the first book was prepared to leave this place behind for good. What I wasn’t prepared for was how much I missed Camorr in almost every minute of the sequel. I can’t even say that the new setting, the exotic island city of Tal Verrar on the coast of the Sea of Brass, was disappointing because I found it interesting as well and especially liked the casino parts with all the gambling that once again made me think of how much „The Lies of Locke Lamora“ reminded me of a fantasy version of „Ocean’s Eleven“ but it just couldn’t even remotely live up to the perfectly-elaborated city of Camorr with all its impressive buildings and their magical luminescent glow of the Elderglass, its extremely detailed social structures and all the fascinating traditions and customs. There was just so much to discover that I felt that it would have been more than enough for another book and I couldn’t help feeling somewhat betrayed that I had to leave this magical place so early. Like in the first book I also struggled a bit with the structure of the story because once again there were several sideplots and Lynch jumped back and forth in time, but while it was rather easy in „The Lies of Locke Lamora“ to tell the different timelines apart because of the age of the protagonists I found the sequel to be very confusing, especially because the two main plots (conning the casino owner Requin and conning the archon Stragos, one of the rulers of Tal Verrar) felt very similar and this made the story feel very chaotic to me and I found it extremely difficult to follow the plot(s). Another thing I didn’t really like was that the middle part felt like reading a completely different book to me because it didn’t seem connected to the rest of the book at all and while I was excited about Locke Lamora and his loyal friend Jean Tannen getting a glimpse at living the life of pirates this whole middle part only felt like a HUGE interruption to me. I wanted to know how the Tal Verrar schemes would work out and watch Locke and Jean betraying people in the casino but instead I was forced to live through this super boring and tedious sailing interlude where Scott Lynch took way too much time to teach his characters how to sail a boat and learn all the nautical vocabulary and I didn’t find that interesting AT ALL. To say something positive for a change: I kept enjoying following Locke and Jean and see them banter, scheme thefts together and live through dangerous situations but I sometimes missed the old times when there were still more Gentleman Bastards and they got to work as a group. On the plus side Scott Lynch introduced new interesting characters like the female (!) pirates Zamira Drakasha and Ezri Delmastro and I also liked how the characters of Locke and especially Jean evolved with the new challenges they had to face and I can’t wait to see what the future brings for these two. Where were all the things I loved in the first book? I know this was a lot of criticism and it’s important for me to say that overall I still did enjoy „Red Seas Under Red Skies“ but compared to the almost perfect first book it just was a huge disappointment for me. The things I loved most about „The Lies of Locke Lamora“ were the extremely fascinating setting and its incredibly detailed worldbuilding, the exciting schemes, the great humor, the unpredictable twists and turns, the dark and intriguing atmosphere, the sudden bursts of violence that often came so unexpected and shook me to the core and all the different emotions that the story provided and unfortunately I felt like so many of those elements were missing in the sequel. Tal Verrar was way less interesting than Camorr, the thefts and cons didn’t seem as brilliant as they used to be and the story was rather predictable and couldn’t surprise me as much as in the first book but what I missed the most were all the emotions because I didn’t even nearly laugh as often in the sequel and even the supposedly shocking twist didn’t really hit me in the feels. It took me only 13 days to read „The Lies of Locke Lamora“ but 87 (!) 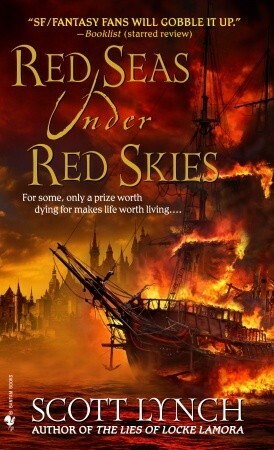 days to read „Red Seas Under Red Skies“ and that alone says a lot about how different my reading experiences with the first two books in the Gentleman Bastards series were. 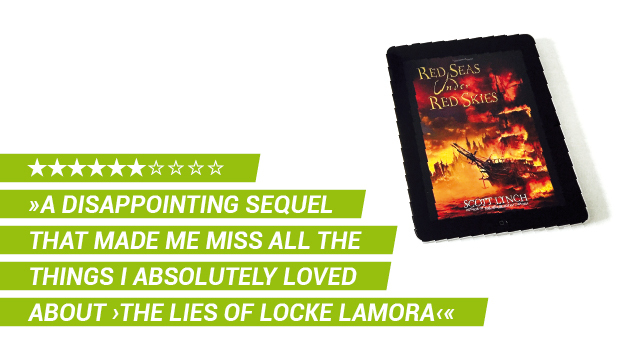 While I absolutely LOVED „The Lies of Locke Lamora“ I felt pretty disappointed by the sequel „Red Seas Under Red Skies“ for several reasons: the new setting of Tal Verrar couldn’t live up to the first book’s Camorr, the plot was way less exciting due to a very confusing beginning and a tedious middle part and Scott Lynch didn’t manage to provide the same range of emotions that had made the first book so intense. I’m sorry you didn’t enjoy this one as much as Lies. I understand where you’re coming from, though – the story definitely has a different rhythm. I felt the two halves (the Tal Verrar and the sailing) weren’t matched together as well as they could be. I think you’ll like Republic of Thieves better – I just finished my re-read of it and it’s much more similar to Lies! I was so shocked and excited when the second book started with the big betrayal but sadly the prologue was already the most thrilling part for me.